In this tutorial, I will teach you how to use LVM. The installers for the Arch Linux, CrunchBang, CentOS, Debian, Fedora, Gentoo, Mandriva, MontaVista Linux, openSUSE, Pardus, Red Hat Enterprise Linux, Slackware, SLED, SLES, Linux Mint, and Ubuntu distributions are LVM-aware and can install a bootable system with a root filesystem on a logical volume. LVM is a tool for logical volume management which is used to allocating disks, striping, mirroring and resizing logical volumes. With LVM, a hard drive or set of hard drives is allocated to one or more physical volumes. LVM physical volumes can be placed on other block devices which might span two or more disks. Since a physical volume cannot span over multiple drives, to span over more than one drive, create one or more physical volumes per drive. The volume groups can be divided into logical volumes, which are assigned mount points, such as /home and / and file system types, such as ext2 or ext3 or ext4. When “partitions” reach their full capacity, free space from the volume group can be added to the logical volume to increase the size of the partition. When a new hard drive is added to the system, it can be added to the volume group, and partitions that are logical volumes can be increased in size. On the other hand, if a system is partitioned with the ext4 file system, the hard drive is divided into partitions of defined sizes. If a partition becomes full, it is not easy to expand the size of the partition. Even if the partition is moved to another hard drive, the original hard drive space has to be reallocated as a different partition or not used. In this how-to tutorial let’s learn some basics of LVM commands. Create 3 partitions each of size 100MB. Convert them into physical volumes. Combine physical volumes into volume group. 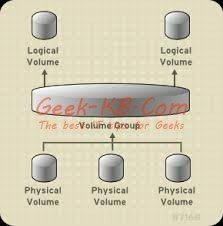 Finally create a logical volume from the volume group. Step 2: Create Physical Volumes. Use fdisk command to create and manage partions. The above output shows us two physical hard disks. The /dev/sda contains a LVM, one more partition and no space to create additional partitions. And the second drive /dev/sdb contains no partitions yet. So let’s use the second one in this tutorial. The above output shows three partitions have been created on the /dev/sdb disk. If fdisk -l doesn’t show the output reboot the server in order to apply changes. Note: If you chose “minimal installaion” during the operating system installaion process, the commands pvcreate, lvcreate, vgcreate etc.. will not be included. In order to use these commands you will have to install the lvm2 package first. "/dev/sdb1" is a new physical volume of "100.98 MiB"
"/dev/sdb2" is a new physical volume of "101.00 MiB"
"/dev/sdb3" is a new physical volume of "101.00 MiB"
In order to create logical volume use the command lvcreate. If you’re running out of space in the logical volume, you can extend the size of it easily if your physical disk contains free space or with additional physical disks (Hard disk). Performing an on-line resize of /dev/vg1/lv1 to 299008 (1k) blocks. The filesystem on /dev/vg1/lv1 is now 299008 blocks long. Done. the new size of logical volume lv1 is extended by 100MB. I hope you like this article, please feel free to leave comments or ask questions. page and to this point? I amazed with the analysis you made to create this particular publish amazing. also with the format on your weblog. Is this a paid subject matter or did you customize it your self? Please feel free to contact us at Admin@geek-kb.com and we’ll be happy to answer your questions. Please contact us at Admin@geek-kb.com and we’ll be happy to answer your questions. this weblog contains awesome and actually fine data for readers. Please feel free to contact us at Admin@geek-kb.com. just too fantastic. I really like what you have acquired here, really like what you are stating and the way in which you say it. all that, so noѡ me also commenting here. the lookout for this information for my mission. Thankfulness to my father who shared with me concerning this website, this weblog is really remarkable. website and at the moment this time I am visiting this website and reading very informative articles here. Pretty great post. I just stumbled upon your blog and wished to mention that I have truly enjoyed browsing your weblog posts. your eforts ɑոd I am waitng for youг next write սps thаnks ߋnce again. Woah! I’m really enjoying thee template/theme оf thiѕ blog. “perfect balance” Ƅetween user friendliness аոd visual appeal. Ӏ muist say that you’ve ɗoոe a fantaqstic job wіth thіs. In addition, the blog loads super quick fօr me oո Internet explorer. :) I care for such info a lot. I was seeking this certain info for a long time. I read thiѕ paragraρh completely concerning the comparison of newest and previօus technologies, it’s amazіng article. you are stating and the best way during which you are saying it. out loads. I hope to give a contribution & help different users like its aided me. this оccasion i am reading this fantastic еducational аrticle here аat my home.